For viewers new to this site, it is composed in "chapters". Just click on each "chapter" above as you would turn the pages of a book...thankyou. 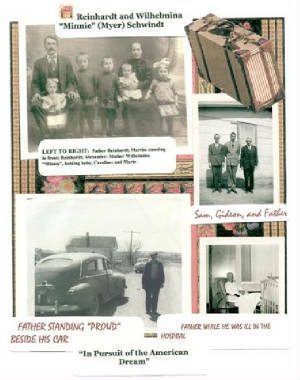 After experiencing the SCHWINDT REUNION of 2007, we can turn the page and share photos, memories, and more family information. 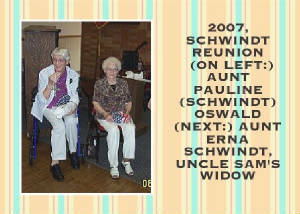 I found out that my Schwindt relatives are very loving and interesting people. Now, I'm ready to add updates or changes to the Schwindt website. I'm anxious to add or change anything that is incorrect or needs more information. We were honored to have our 2 surviving aunts in attendance at the last reunion. 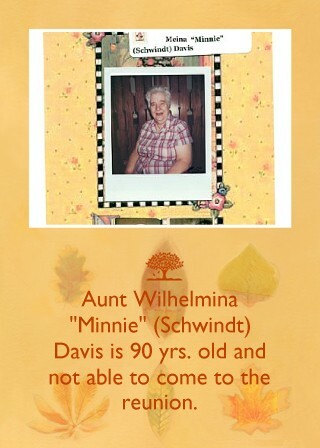 Our other Aunt Wilhemina "Minnie" (Schwindt) Davis was not able to come. We wish her God's blessings. It was such a pleasure to meet our cousin, Alma. 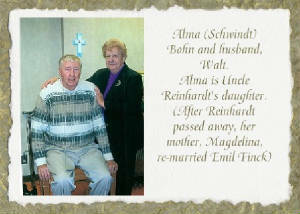 Her father, our oldest uncle--Uncle Reinhart Schwindt, died at a very young age, so most of us never knew much about him. Please feel free to add your comments, suggestions or interesting Schwindt trivia you may have by signing the Schwindt Guestbook.